Salmon, smoked haddock and king prawns in a cheese sauce topped with fresh mashed potato and Cheddar cheese. Generous chunks of salmon, smoked haddock and king prawns in a velvety mature Cheddar sauce. We use the most succulent fish for our pie, which of course deserves the very best sauce. Our experts use fish stock, white wine and a mature West country Cheddar to give it lots of depth, richness and creaminess, with chopped chives and a hint of tangy Dijon mustard to add a little kick. Fluffy British Maris Piper mash finishes the dish beautifully. 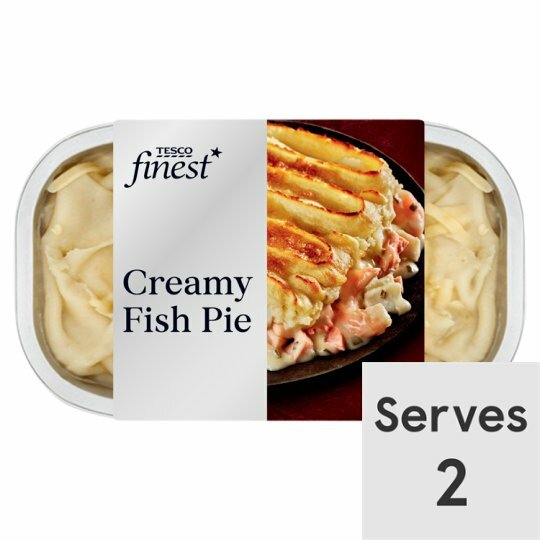 INGREDIENTS: Potato, Salmon (Fish) (14%), Haddock (Fish) (9%), Single Cream (Milk), Cheddar Cheese (Milk)Whole Milk, King Prawn (Crustacean) (4.5%), Water, Double Cream (Milk), Butter (Milk), White Wine, Cornflour, Salt, Chive, Cod (Fish), Plaice (Fish), Black Mustard Seed, Gelling Agent (Pectin), Corn Starch, Spirit Vinegar, White Pepper, Sugar, Sunflower Oil, Pepper Oil. Instructions: 190°C / Fan 170°C / Gas 5 30mins Place on a baking tray in the centre of a pre-heated oven. Leave to stand for 1 minute after heating. Caution: This product contains raw fish.Caution: This product can contain minor bones..